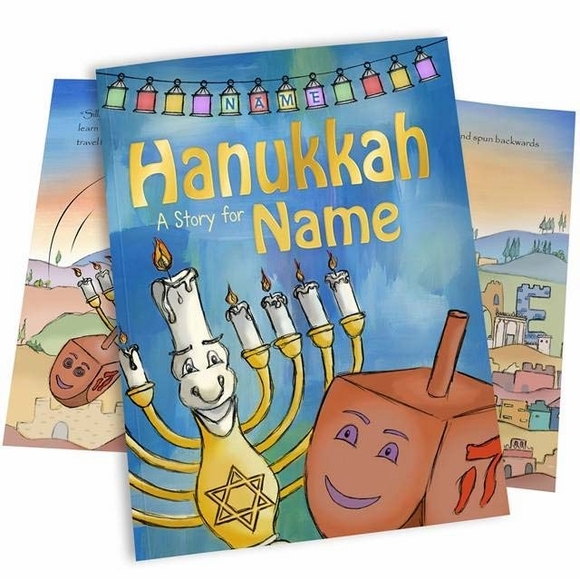 Personalized Hanukkah Story Book for Kids - - in which the Menorah tells the story of Hanukkah. It's almost the first night of Hanukkah, and one little dreidel, whose name just happens to be the same as your child's name, is very excited. But why do we celebrate Hanukkah? Luckily, the Menorah is here to explain. This delightful tale includes your child's name in the title and throughout the book as the little dreidel travels back 2000 years to the temple and streets of Jerusalem where he or she meets the Maccabees and learns about the miracle of Hanukkah, the Jewish Festival of Light. The beautiful illustrations help to bring the miracle of Hanukkah alive and teach your child about the importance of the Jewish festival of lights. And you're sure to keep their attention as they spot their name throughout the colorful illustrations. Personalization: child's first name (up to 12 characters). 8" x 12" soft cover and hard cover editions. As a bonus the book explains the traditional Chanukah game of Dreidel and includes words to the Dreidel song. Part of our Judaica gift collection and sometimes asked for by customers as our Jewish gifts.